Terrible Tim is a bit of a troublemaker. He doesn’t mean to be, but he just can’t help it! Terrible Tim likes to draw...on the walls. Terrible Tim likes to roar….and scare all the birds in the garden. Terrible Tim likes to dash… through the laundry on the washing line. And Terrible Tim likes to splash...all over mum while she’s giving him a bath. Children will love seeing what mischievous things Terrible Tim gets up to. While parents will be able to relate to this book centering around the craziness of raising a toddler. This rhyming book contains simple and repetitive language, which makes it great for targeting language and speech sound goals. I like using this book to target simple action words, as well as the /t/ sound. 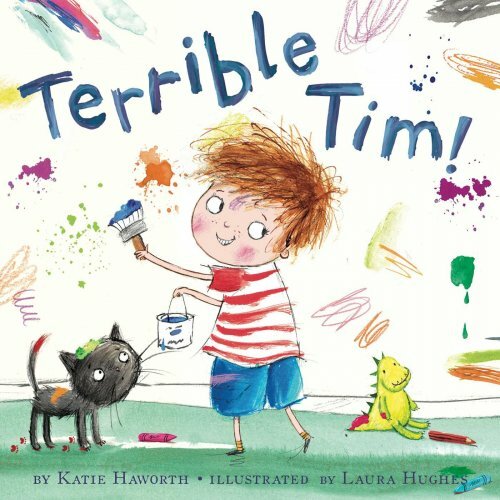 The illustrations in Terrible Tim clearly depict the chaos that can sometimes surround a toddler’s antics throughout the day. These illustrations also allow for further language development as children label the pictures and draw inferences based on what they can see. How might mum be feeling? How is Tim feeling? Why is Tim sad? For more speech and language targets in this book, see the list below.